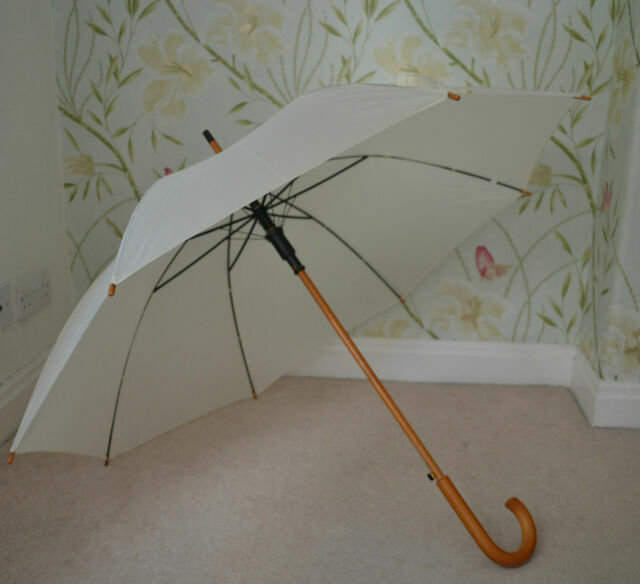 LARGE IVORY CREAM WOODSTICK UMBRELLA. IDEAL FOR WEDDINGS - PERFECT FOR A WEDDING GUEST, PHOTOGRAPHER OR EVEN THE GROOM! PUSH BUTTON AUTOMATIC OPENING. EXCELLENT QUALITY & ELEGANT SHAPE WITH CONTRASTING WOODEN HOOK HANDLE. Singing in the rain and sun. Very pleased with umbrella/parasol. Perfect for walking along the promenade in the sun and the rain. Good quality, sturdy handlle, well made. I bought it for a wedding but have found it very useful already.